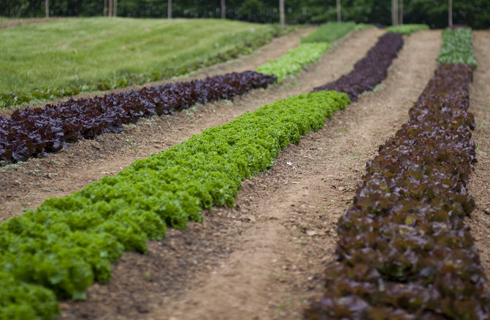 The Piedmont is paradise for small-scale farmers. We have an outstanding sustainable agricultural extension agent and a model community college program that trains and supports future farmers who want to use the best organic practices. Add to that dozens of farmer’s markets and CSA’s, several natural foods groceries, plenty of locavore restaurants, and a growing market of savvy consumers hungry for fresh local food. The region also boasts a sustainable meat processor and soon will open a “value added” center where farmers can process and package jams, jellies, baked goods, etc. from their farm goods. No wonder folks who want to be sustainable farmers are flocking here from all over the country. But there’s one problem — the price of land near good markets has become too steep for many who are just getting started. Bill Dow, one of the most experienced and respected small-scale farmers and advocates in the region, has an innovative solution. 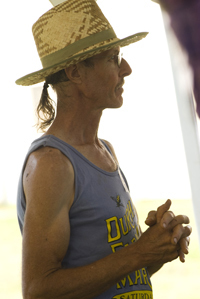 Three decades after he helped launch the Carrboro Farmer’s Market and became North Carolina’s first certified organic farmer, Bill is ready to lease out parcels of his expertly cultivated land one year at a time to prospective farmers who can’t afford to buy their own place yet. In exchange for a modest monthly fee, the “Growers of Ayrshire Farm” will have access to terraced plots that are ready to grow, crops that are tested, markets and relationships that are well established, and mentoring from a seasoned pro. It’s a darn good deal for anyone trying to get started with very little risk or investment — a chance to develop a viable enterprise at one of the best farms in the area, while learning firsthand from a pioneering leader who has mentored countless new farmers and knows what it takes to succeed. Ayrshire Farm is located on a scenic rural road in the middle of Chatham county, six miles west of Pittsboro and Central Carolina Community College’s Sustainable Agriculture Program, 20 miles south of Chapel Hill and the famed Carrboro Farmer’s Market, and 40 miles west of Raleigh and more markets. To learn more about Bill and Ayrshire Farm check out this video. 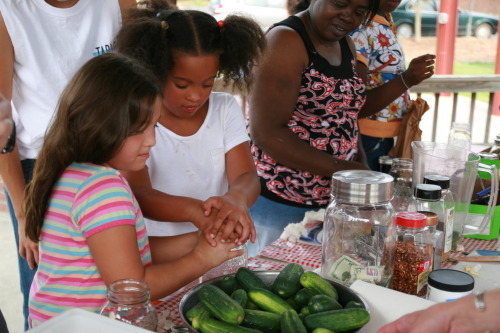 Kids learning how to make pickles at Carrboro Farmer’s Market. School children from after school programs in Chapel Hill and Carrboro are taking home more than spelling lists and math sheets this fall. Carrboro-based nonprofit TABLE is sending them home with “healthy homework” – snack recipes and fresh food sourced from local farms through Farmer Foodshare. It’s a way to connect local farms with families who don’t have access to healthy food. This month, volunteers from TABLE brought fresh ingredients from local farms to the center and showed the kids how to make Striped Rollups with green peppers, arugula, cheese and tortillas. After watching the demonstration, the children made Striped Rollups themselves, and then took home the ingredients and “know-how” needed to prepare the snack for their families. “I can’t wait to show this snack to my mom,” said one of the fourth graders at The Hargraves Center afterschool program. “She loves peppers!” The snack program, TABLE for Two, sends trained UNC-Chapel Hill students to low-income after-school programs in Orange County. TABLE focuses exclusively on local childhood hunger, distributing healthy food to Chapel Hill-Carrboro children each week, as well as providing UNC student mentors to encourage kids to make healthy eating choices. The fresh snack training program is based on an embedded learning model in which students watch something, do it on their own, and then teach another what they learned. In TABLE for Two, children watch their mentors make snacks from locally grown produce and then prepare the snack on their own. After the program, children are sent home with fresh ingredients from local farms to make and share the snack with their families. TABLE receives fresh produce from local North Carolina farmers through a partnership with nonprofit Farmer Foodshare. The organization links farm-grown food to growing children through its Farm to Children program. Farmers from Carrboro Farmers Market provide TABLE with weekly donations of gleaned fresh produce as well as discounted produce specifically for snacks. “Healthy Homework” is part of the Table for Two Healthy Eating Program, one of several hunger relief programs sponsored by TABLE. TABLE is a non-profit hunger-relief organization focusing exclusively on local childhood hunger. Each week, TABLE puts healthy food, including farm fresh produce, directly into the hands of Chapel Hill and Carrboro elementary school-age children who would otherwise go hungry on weekends and other times of the year when free school meals are unavailable. It brings together UNC students and community members to provide food to local hungry kids and raise awareness of local childhood hunger. During the 2011/2012 school year, TABLE sent home more than 45,000 pounds of food to hungry Chapel Hill-Carrboro children. Please visit www.tablenc.org or email tablenc@gmail.com for more information. 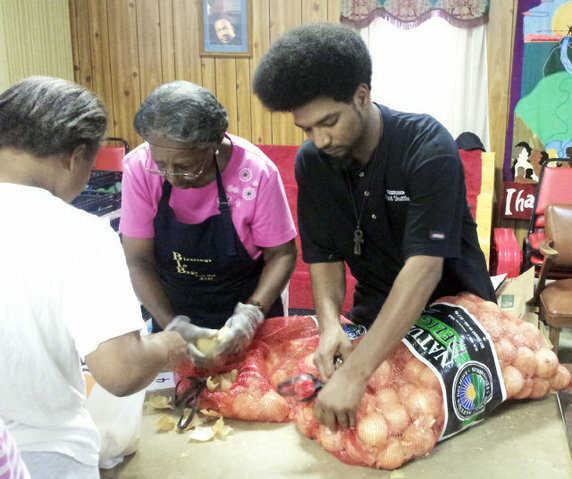 Handing out onions at the Inter-Faith Food Shuttle’s mobile market at Martin Street Baptist Church in Raleigh. Photo by Billy Lane in the News and Observer. Folding tables lined with oranges, apples and sweet-smelling strawberries. Cardboard bins bursting with cabbage, collards and all kinds of bread. Aproned workers wearing bright and helpful smiles. This was the healthful and happy picture that recently greeted folks who moved from a line outside Martin Street Baptist Church into the Inter-Faith Food Shuttle’s first mobile market open to all in need in Raleigh. More than 115 families walked away with bags and boxes stuffed with some of the 10,000 pounds of goods that IFFS had hauled to the church in two refrigerated trucks. • Feed? IFFS is filling the school-year gap by providing breakfast, lunch and snacks this summer to children in low-income areas. In Wake County, where 33 percent of schoolchildren qualify for free and reduced-price lunch, food is available in eight locations. • Teach? The nonprofit offers a culinary job training program that prepares those with severe life challenges for careers in food service. It also offers apprenticeships for teenagers interested in learning how to farm. • Grow? IFFS has its own 6-acre farm in Raleigh and helps low-income neighborhoods start community gardens. Once I heard Jim Minick read from The Blueberry Years, I knew I had to take one home with me. It wasn’t just that this “memoir of farm and family” was named the SIBA Best Non-Fiction Book of the year. Or that Jim is a superb writer and story teller. Or even that his book might contain a young couple’s familiar real-life account of how they found their calling on an organic farm at the end of a dazzling country road. What really attracted me was Jim’s honest approach to each story, which I suspected would reveal much more than the usual sustainable farmer’s story of salvation. The first hint was when someone asked about the book’s cover image. Jim winced and quietly acknowledged that the idyllic scene on the front was not his farm after all. 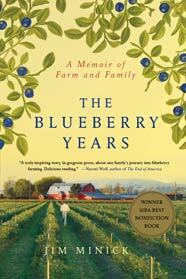 The publisher took a picture of a dairy farm, Photo-Shopped in an image of a man walking down a central row, and added some generic berry bushes. We’re not sure they’re even blueberry bushes. The result is a symmetrical flat field that bears no resemblance to the Floyd County, Va. , hills where Jim and Sarah planted and mulched their pick-your-own berry operation over the course of a decade. 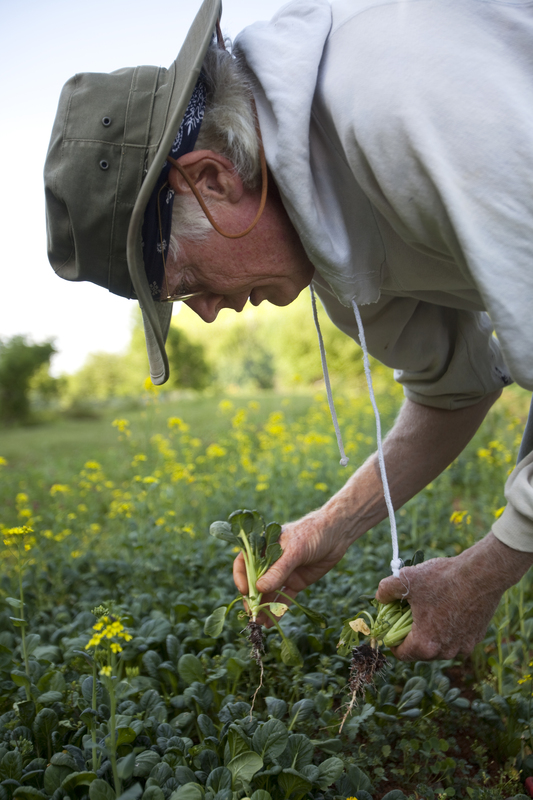 Jim allows us to taste the freshness of ripe berries, the richness of teaching yourself a new way of life, the challenge of making new friends, and the inconvenient truths about the economics of small-scale farming. Though he and Sarah usually excel at everything they try, they can’t harvest a viable living by cultivating one of the first organic blueberry farms in the mid-Atlantic region. Even after they pay off the mortgage in less than four years (! ), it looks like their off-farm income will always have to exceed the dollars they glean from some of the healthiest blueberries the Blue Ridge has to offer. It’s not their fault of course. It’s the reality of “sustainable” farming that is often not so sustainable for farmers even when they do their homework and their chores as well as these two bright pioneers do. In the end, Jim and Sarah decide they desire time to pursue writing and basket-making more than farming. They sell the blueberry business and move to the next county, where they live as teachers and artists, enjoy a slower rural pace, and grow enough food for their table. The Blueberry Years were hardly wasted, though, in the living or the writing. This is the best small-farm book I’ve read in years, precisely because it’s as much about pursuing one’s passion as it is about how farming should be. I wish I could send a copy to every ag official and politician in the country, so they could learn a few lessons about what’s really needed to improve the future of sustainable farming. I’m glad Jim has more time to write these days and I look forward to the completion of his novel in progress. My spring garden started sprouting early this year. 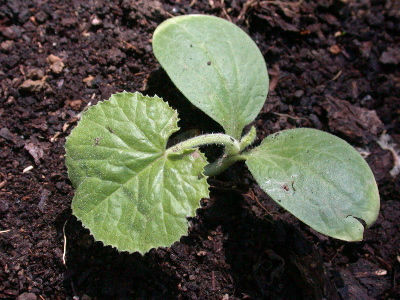 Even before my sugar-snaps germinated in late February, something unexpected sprung up in the pea patch. Looked like squash seedlings, but that couldn’t be, since my zucchinis and summer squash got wiped out by the bugs and worms last year, and the year before, come to think of it. A few days after I disposed of the new squash look-alikes, the same sturdy little boogers started peeping up in the arugula bed. Then amidst the chard and red-leaf lettuce. Dang. Who invited these unexpected visitors anyway? No problem, I kept snatching the volunteer seedlings up and tossing them away like weeds. But they kept on poking their perky little heads through the soil. Soon the strangers were showing up in the bed I had prepared for tomatoes, but hadn’t even planted yet. What the heck? Then I remembered. Last fall, I threw several rotting Halloween pumpkins into my compost bin. They bio-degraded very nicely, thank you very much, and I smugly dumped the most excellent results on all of my garden beds. Now I’ve got pumpkin bumpkins sprouting all over the place. File this in the department of unintended consequences, next to the humility lessons. Hmm, maybe next year I should save some zukes, instead of eating every last scrap, to throw in my compost pile . It may be the only way I’ll ever get a decent squash crop. Just another reminder that no matter how efficient and earnest we are in the garden, we’re not always really in charge after all. I haven’t bought a cookbook in years. When I need a fresh idea for dinner, I Google a new recipe or improvise on an old one based on what’s in the fridge and the pantry. Yet one of the most important books I’ve read, and re-read, this year is Food Matters, by Mark Bittman, the New York Times Minimalist columnist. Of course it’s not really a cookbook, but rather, as the subtitle claims, “A Guide to Conscious Eating.” The fact that it includes 75 recipes is a bonus. Bittman’s premise is that we can change our impact on the world and our health by making a few simple but profound adjustments in the way we eat and cook for the rest of our lives. After reading his book and following his advice, I believe he’s right. This is not about losing weight, though if you follow Bittman, you will inevitably shed pounds. It’s also not about counting calories, because if you eat wisely, you can eat as much as you want (and even splurge on the high-cal stuff once in a while). Bittman’s plan requires no secret ingredients or complicated rules. And it won’t cost you more than you’re already spending on your diet, because you’ll be cooking more and spending less money on meat and junk. He says, simply, we should eat less meat and processed foods, and more fruits, vegetables, legumes and whole grains. Sounds like Michael Pollan right? The only difference is that Bittman shows us how to do this with ease and flavor, and without breaking the grocery budget. 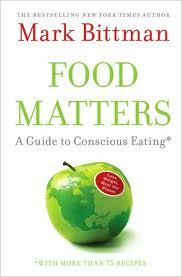 Bittman believes that food matters more than just nutritionally. Industrial agriculture depends on petroleum-based pesticides and transportation, producing more than its share of carbon emissions, thereby contributing to climate change. What’s more, factory meat farms use too many hormones and antibiotics, and also degrade the landscape. And processed food contains too much fat and high fructose corn syrup, contributing to diabetes, obesity and other diseases. Okay, we knew this. While Bittman acknowledges it will take wholesale policy revisions to dramatically reduce Big Ag’s impact on climate change, he shows that what we do in our own household will matter, and may influence policy change down the road. That got my attention. The Minimalist is not interested in tying anyone to the kitchen stove. He takes a practical approach to cooking and shopping. Stock the pantry with basic staples (flour, grains, olive oil, herbs and spices) and the fridge with fresh fruit, vegetables , eggs, cheese and if you like enough meat to enhance your meals. Do this and you should be able to whip up a great healthy dinner in no time. He also recommends cooking up a pot of beans and a pot of grains every week, so that you’ll have the basis for many meals that can be put together quickly. Cook up a big batch of your favorite meal and freeze some for those times when you’re too busy to plan dinner. Take the leftovers to the office for lunch. For folks who don’t know how to do this, he includes a simple daily plan with recipes. I’ve tried his approach and he’s right: it has transformed the way I shop, cook and eat, all for the better. Now you’ll have to excuse me while I re-heat my favorite tomato-white-bean-onion soup and grab a slice of the no-knead bread that was baking while I wrote this. I’m about to do my bit to reduce global warming the Bittman way. People, please: Pittsboro’s Pepper Festival is uPon us. 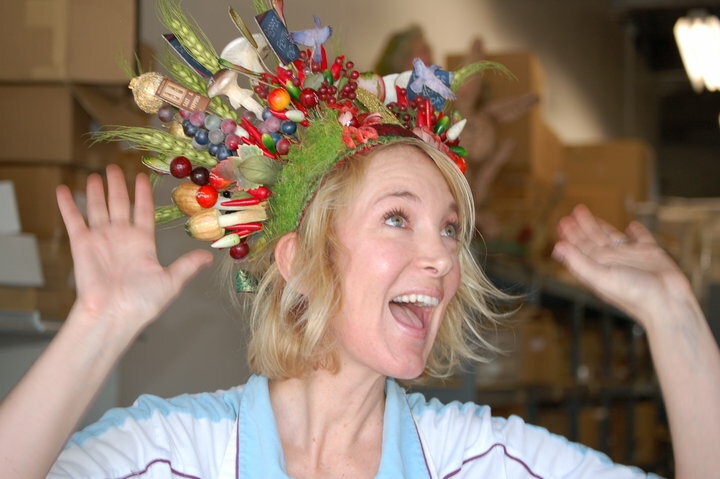 Sunday 10/3 from 4 to 7 PM, at The Plant, aka Piedmont Biofarm at Piedmont Biofuels’ permissible eco-paradise in PBO. Sgt. Peppers (that’s Farmer Doug, peeps), presents perfect peppers for Piedmont permaculture pastures. Plentiful chefs promise palatable plates. Plus pretty peppy music. Purchase passes now online ($15) or procrastinate and pay more at the door.